Recent reports have shown that California knew about the threat of climate change decades ago. No one could have missed the testimony of James Hansen in 1988 and many excellent papers were published prior to that time (and, of course, subsequently). Californian policymakers cannot claim ignorance. I’m not a resident of California but I often visit this great state and seeing this new petition I’m hoping that everyone concerned about the climate of California will get onboard to denounce the past and current state governments and, especially, to ensure that current residents get to sue these politicians. They knew, and yet they kept burning fossil fuel. History will judge them harshly, but in the meantime, the people should ensure these politicians feel the pain. Yes, but California didn’t pretend that they didn’t know about climate or pay people to spread misinformation. No, you’re wrong, Chubbs, California pretended that they didn’t know about the effects of climate change on their state, precisely when they failed to disclose what they knew to investors in their state. They did not need to pay people to spread misinformation — they created misinformation by providing NO information at all to their investors, regarding this impending climate damage that they KNEW about. I don’t understand what all this fuss is about. Might well be that politicians knew but was there an acceptable “solution” to the problem ? Do we know even today how to solve the massive intermitence problem of the renewables ? Without killing a lot of people ? Do we know how to solve the transport and agriculture problem with renewables ? Did we see by then the climate scientists, who even knew certainly much better than politicians, cut seriously their CO2 emissions, show the example and how to do it ? Funny homo self- proclaimed “sapiens sapiens” ! ‘Do we know even today how to solve the massive intermitence problem of the renewables ?’ In the case of California, it’s pretty obvious- keep Diablo Canyon open, start San Onofre back up again, and scrap the ‘ renewables mandates ‘ in favour of ‘ non-fossil power mandates’. That would be a good start. SoD, Arnold is going to gas you. I am not sure what the intent of this is. So what if California politicians knew before? California has one of the best programs now. Is the intent to gather up old politicians and sue them? What will this accomplish? It seems acrimonious, when we should be encouraging and learning from California. Also, lots of states and the Federal Government knew before. What is the reason for picking on California? Pick on Scott Pruitt. on March 27, 2018 at 2:50 pm | Reply Mike M.
SoD is assuming that his readers have heard of the silly #ExxonKnew business and will realize that this is about that. As usual, most, if not all, don’t get that this is satire. That’s why I usually include a /sarc tag when I do this. Yes, we should learn from California, but it’s mainly about what not to do, like spending vast amounts of money on high speed rail that will go from nowhere to nowhere else for many years, assuming it gets built at all. That’s not sarcasm. It’s almost unfair, though, to pick on California because it’s such an easy target. Did you know, for example, the the state of California “knows” that crystalline silica, otherwise known as sand, causes cancer? This is in a state that brags about it’s beaches and has the third longest ocean coastline of the 50 states behind Alaska and Florida (or fifth longest if you include tidal areas where Louisiana and Maine are also ahead of California). And to make things better, California has just been forced to add coffee to the Proposition 65 list of things the state of California ‘knows’ will cause cancer because coffee contains traces of acrylamide. Meanwhile, there may be credible evidence that consuming moderate amounts of coffee reduces the incidence of a number of degenerative conditions like type II diabetes. They warn you against using “products with ingredients known to cause cancer or reproductive harm as listed in California’s Proposition 65” to clean your boat, but nary a peep about the much greater cancer risk of just being out in the sun. I happen to be in Caleefornia at the moment. Everything is crazy expensive, specially gasoline. And yes, just about everything causes cancer, including multi-cellular life itself, so Caleefornia is right about the sand. It seems that many people don’t recognize satire. This article is tongue in cheek, a satirical jab at the entertaining #ExxonKnew campaign and current court case to sue said oil company and others: The People of the State of California v. BP P.L.C. et al. California knew everything that Exxon knew. – Manabe and Wetherald published their seminal paper: Thermal equilibrium of the atmosphere with a given distribution of relative humidity in 1967. – Ramanathan and Coakley published their paper: Climate Modeling through Radiative-Convective Methods in 1978. – 1000s of other papers added to the analysis. – James Hansen gave his testimony on global warming to the Senate committee on Energy and Natural Resources in 1988. There are no secrets here (see note 2). Why did California burn fossil fuel in that case? 1. Luckily this wide range from 1979 has more recently been narrowed down to 1.5-4.5’C. 2. Except the secrets of what globally averaged warming we will actually get from doubling of CO2 (see note 1), how that will affect a region like California in temperature change, what rainfall changes will occur in California (climate models don’t agree whether doubling CO2 will result in less rain, more rain or the same rain for the state), whether the devastating effects of sea level rise will be because of the 0.3m rise (bottom end of the IPCC range) or the horrors of the 0.6m rise (top end of the IPCC range). This is from California Winter Precipitation Change under Global Warming in the Coupled Model Intercomparison Project Phase 5 Ensemble, Neelin et al, 2013 under the RCP8.5 “extreme scenario” of quadrupling CO2 by end of century. The idea of running RCP8.5 is the signal should be easier to differentiate from the noise. I meant from (d) onwards in the comment above. neighboring ocean region; at the latitudes corresponding to central California, 13 of 15 agree on an increase, but by 30N, less than two-thirds of the models show an increase. In terms of California water resources, the rainfall associated with storms arriving on the Sierras is a key feature, so high agreement on winter season rainfall at these latitudes would be positive news not only for central California but also for Southern California, because of the existing infrastructure for water transfer, despite less clear agreement on rainfall change from Los Angeles southward. Comparing to the CMIP3 ensemble (Fig. 2), in both the MME mean and agreement on sign, the shift of the positive region is notable— but precisely because it is a shift of a boundary, it must be evaluated critically. We note that hints of the stormtrack extension feature off the California coast may be seen in the CMIP3 models, but they are not nearly as developed as in the CMIP5 models. 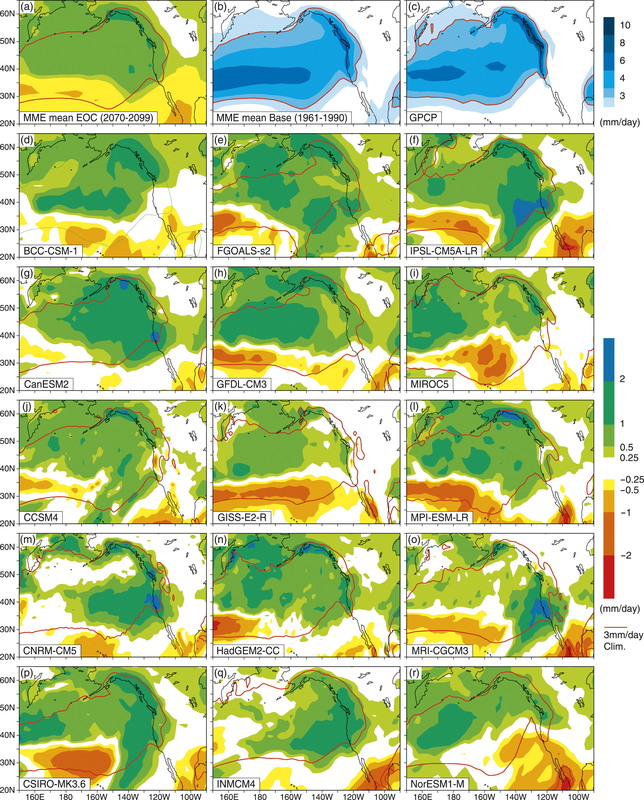 While this feature represents a departure from zonal symmetry, we can begin by examining the precipitation simulation of the individual CMIP5 models as a function of latitude for an average over this feature. Perhaps the people of northern California should be suing themselves, Exxon, and people who write blogs which identify uncertainties – for the upcoming increase in rainfall. While people in Southern California should be suing themselves, Exxon, and people who write blogs which identify uncertainties – for the upcoming decrease in rainfall. People in central California should be suing themselves, Exxon, and people who write blogs which identify uncertainties – for being left out due to the likely lack of any change in rainfall. More from Neelin et al 2013. Here we see in the top graphic historic rainfall by latitude – with observations being the black two lines (coming up with different amounts, even observations are difficult) and models being the rainbow. Satire only works if the target can be forced to appreciate the absurdity of their argument…. ‘the Irish should eat their own children’ was effective satire. Some will appreciate your humor, but I suspect almost none of those who most need to. Climate modeling is a daring thing and the outcome fairly uncertain. It’s fortunate rather than unfortunate IMO. The mean sea level (MSL) trend at San Francisco, CA, USA is +2.00 mm/year with a 95% confidence interval of ±0.20 mm/year, based on monthly mean sea level data from 1906/5 to 2018/1. At that rate, San Francisco will see about 6.5 inches of sea-level rise by 2100. 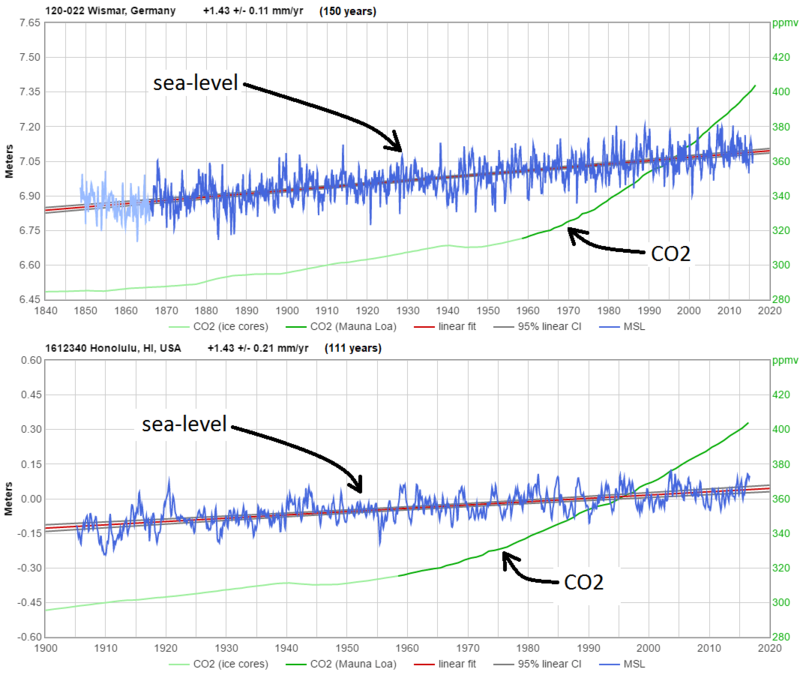 There’s no sign of any effect on rate of sea-level rise from rising CO2 levels. San Francisco GPS “not robust” because of tectonics. Those measurements are not GPS-corrected. They don’t detect much vertical land movement. Other than that little unpleasantness in 1906, San Francisco has been pretty stable. There’s no sign of a significant effect on rate of sea-level rise from rising CO2 levels, anywhere. This is the Sonel station that is nearest to San Francisco TG. Not robust. Shows some elevatoin 2013 -14. No vertical land movement before that. Dave: Sea level data tends to sow high lag_1 correlation, so the confidence interval for acceleration should be much wider than you show. When I looked into satellite altimetry data, the autocorrelation was so high that the Quenouille correction produced one independent data point every 18 months rather than once a month. Next step of the Green Religion is the political and legal violence . The objective is clearly to threaten all political opponents and destroy them ( with at least jail or even worst) . (1.5%/decade)/(0.18 K/decade) = 8.3%/K increase in TPW. Since this is higher than the 7%/K increase for saturation vapor pressure, this hints at an increase in relative humidity. 0.18 K is surface warming. For the whole atmosphere, UAH6.LT and RSS TLT V4 are 0.13 and 0.20 K/decade; affording increases of 11.5% and 7.5%/K. Properly quantifying the change in “relative humidity” for a column of atmosphere isn’t a trivial calculation. You need to start with a Ts and temperature profile for each grid cell. If I remember correctly, a 7%/K increase in saturation vapor pressure is accurate only near 288 K.
on April 23, 2018 at 6:26 pm Mike M.
I expect that the difference between 8% and 7% is not significant with respect to the error bars. An 8% change in the column amount does not mean an 8% change in the surface partial pressure since the vertical gradient could change. Off hand, it sounds to me like the results indicate that the measured changes are consistent with roughly constant RH in the boundary layer. But does anyone really doubt that? The debatable issue is water vapor in the upper troposphere. But that has little effect on column water vapor. Mike: Thanks for the reply. The difference between 7.0 and 8.3 %/K is roughly 20%. Spread over two variables, it could be experimental error. Figure 11 shows a 12% ci. However, this humidity data does appear to be incompatible with UAH warming, 11.5%/K. As you may remember, I’ve discussed limitations that the surface energy balance places on how our climate can change. A 1% increase in relative humidity over the oceans is a 5% decrease in undersaturation and therefore evaporation (if wind speed remains constant). A 5% decrease in evaporation is a 4 W/m2 decrease in latent heat – the same change in flux as 2XCO2. Over the past 30 years we have experienced about a 50 ppm increase in CO2 or 1/8 of a doubling or 0.5 W/m2, but potentially a 4 W/m2 reduction in latent heat. These small changes in relative humidity are “big game” when converted into W/m2. This is why I bothered to calculate the change. Unfortunately, this paper deals with total column water, not relative humidity in the boundary layer. Well you got me, I was about to say something silly til I saw the satire addendum. Not fair, I thought warmists in general had no sense of humor. Still cross at myself for my bias. A little red meat for the regulars, SoD? Also, you may want to update yourself on Neelin et al. In addition, note that even a bit more rain won’t help much since our water system is so snowpack-dependent. Then there’s enhanced evapotranspiration. Oh yes, and increasingly intense dry years. Re the oil companies, I guess we’ll have to settle for running them out of the state.